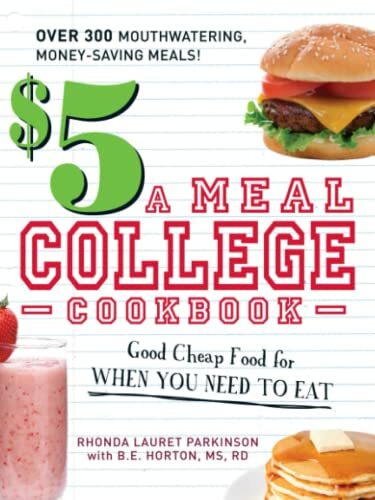 [PDF] $5 a Meal College Cookbook: Good Cheap Food for When You Need to Eat | Free eBooks Download - EBOOKEE! Description: Need a break from the monotony of your meal plan? Can't afford to waste money on lukewarm takeout? Well, now you can ditch the dining hall's soggy excuse for the Monday-night special thanks to this appetite-saving book packed with cheap, easy, and delicious recipes. Offering up more than 300 hassle-free dishes, this cookbook will not only satisfy your hunger but your meager bank account, too! Whether you need a morning-after greasy breakfast, a cram-session snack, or date-night entree, here you'll find ideas for everything you crave, including: * Western Omelet * Asian Lettuce Wraps * Easy Eggplant Parmesan * Simple Pepper Steak * Decadent Apple Crisp Saving you from overcooked, overpriced, and dull dishes, if you have to buy a book for college, this is required reading. 2009-03-06The Healthy College Cookbook: Quick. Cheap. Easy. No comments for "[PDF] $5 a Meal College Cookbook: Good Cheap Food for When You Need to Eat".